Only 1 percent of US farmland is certified organic. Why aren’t more farmers making the switch? Many consumers believe that buying organic is “voting with their dollars” for a more environmentally desirable form of farming. That belief is promoted in organic marketing campaigns. 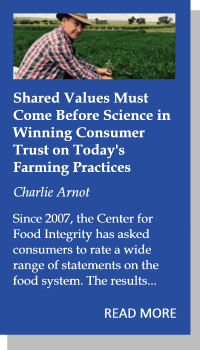 Unfortunately, those consumer intentions are not supported by a realistic assessment of state-of-the-art environmentally optimal farming methods. 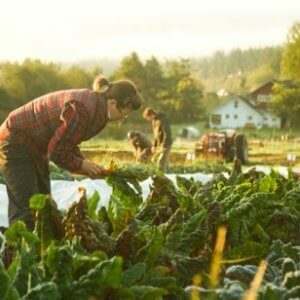 The standards that govern organic farming, set in agreements between the US Department of Agriculture and organic groups, include some important limitations, which preclude some of the most sustainable and environmentally-friendly farming practices. Neither “organic” nor “conventional” are monolithic categories as both include a range of practices. However conventional farmers are free to utilize all the good farming options allowed in organic, while also having access to some useful ecologically sensitive tools that fall into the “synthetic chemistry” and “GMO” categories, but are not available to organic farmers. In many cases those tools are needed in order to implement the most advanced science-guided strategies for the benefit of the environment. 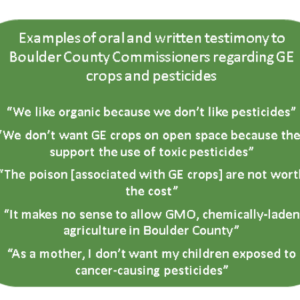 What are the environmental tradeoffs between organic and conventional/GMO systems in terms of pesticides, land-use efficiency, soil building, water quality and greenhouse gas emissions? Many consumers are convinced that organic means no pesticides. In fact, both organic and conventional farmers use pesticides in order to protect their crops from inordinate damage from insects, nematodes, fungi and other pests. Failing to do so would have the environmental downside of reducing the efficiency with which those farmers use resources like land, water, fuel, labor and fertilizer. Not only do both organic and conventional farmers use pesticides, in many cases they use the same pesticides. 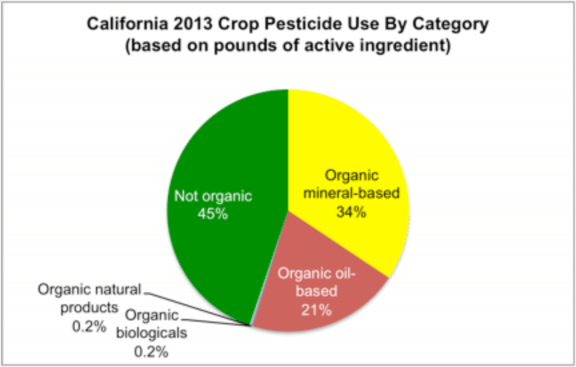 In 2013 in California’s diverse agricultural sector, 55% of the total pounds of pesticides applied were made with chemical or biological materials approved for organic, and those pesticides were used by both categories of growers. In the case of GMO insect resistant crops, the modified plant is producing the very same bacterial Bt (Bacillus thuringiensis) protein that is commonly sprayed on organic fields. For all farmers, the most environmentally sound approach to pest control is to use a wide range of tools including the encouragement of ‘natural enemies’ of the pests, resistance available from the crop’s genetic base and also applied chemical or biological pesticides. This strategy is called Integrated Pest Management or IPM. Conventional farmers are able to include “synthetic” pesticides as part of their IPM programs—options that are often more effective, and require lower use rates and fewer spraying applications. That has cost advantages for the farmer, but also environmental benefits in terms of less fuel use and less soil compaction. In a few conventional crops in which Bt versions have been allowed (e.g. cotton, corn, soybeans, brinjal) even fewer spray applications are needed for the IPM program because the pesticide is efficiently delivered in the plant itself. The synthetic pesticides used by conventional farmers often help to stabilize their IPM programs. For example, there is a current crisis in the California spinach crop in which a sound IPM system is under threat because of the high percentage of organic spinach production (~50%). In organic plantings, farmers are not allowed to use a synthetic seed treatment fungicide to manage downy mildew disease spread through infected seed. The ‘natural’ substitutes are less effective, and as a result even traditional farmers have witnessed failing resistance genes. More fungicide spray applications have been needed by all spinach growers; organic farmers are using less environmentally friendly options such as ‘natural’ copper sulfate, which is acutely toxic, mutagenic, and which can bioaccumulate in the ecosystem, threatening aquatic wildlife. Organic farmers also tend to be more dependent on older, ‘natural’ chemical pesticides such as sulfur, lime sulfur, various salts of copper and petroleum distillates. These chemicals, which are less targeted and can sometimes harm beneficial insects, can end up requiring far more spray trips, and in the case of copper, put a persistent, toxic load on the environment. Many of these issues could be avoided by substituting various environmentally benign, synthetic fungicides — but synthetics are not permitted under organic regulations. Organic farmers can only use pesticides that are considered natural, and that does not always mean safer from a health or environmental perspective. There is already a global shortage of arable farm land. Converting forests or grasslands to farming has well documented destructive impacts, including a reduction in biodiversity and the loss of plant and soil carbon sinks to prevent global warming. A switch from conventional to organic farming would exacerbate this problem, and is a major reason why organic farming, if scaled up, would be so fundamentally problematic. Organic crops are well documented to yield less output for every acre or hectare farmed. 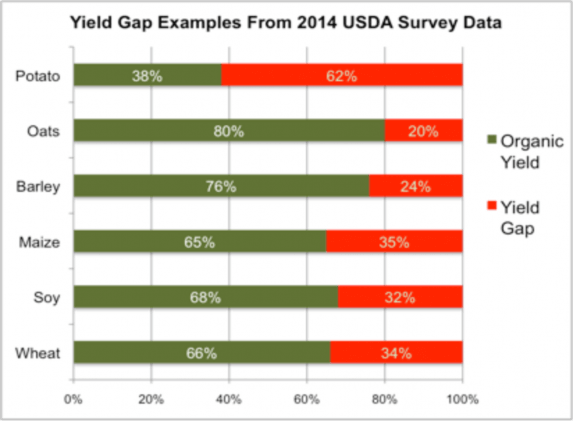 The yield gap ranges from approximately 15-50 percent. Some organic proponents have argued that this difference is diminishing or that it can be overcome, but specifics are scanty. Considering global food demands are expected to roughly double by 2050, the gap is too significant to ignore. 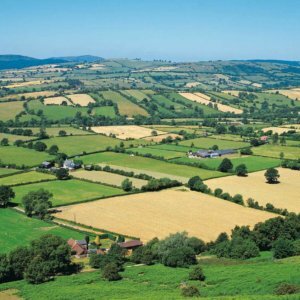 Indeed, a major conversion of agriculture to organic, as critics of “intensive agriculture” campaign for, could lead to environmentally unacceptable pressure for “land use change” — converting even more of the small remaining reserves of wild lands to farming, threatening habitat and biodiversity, ecosystems services, and soil-stored carbon. For major row crops, this negative environmental scenario is only hypothetical, but for fruits and vegetables, organic is already compromising the efficient use of the unique and limited land resources best suited to growing those crops. When the organic movement began around a century ago, its key contribution was a focus on the building of healthy soil. 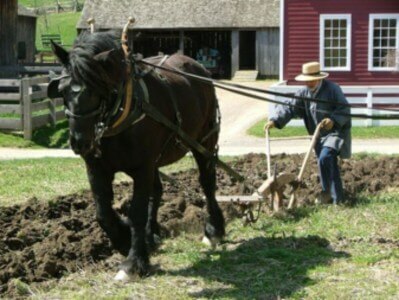 The standard, plow-based agriculture of the pre-industrial era was not the romantic ideal we often imagine. It was essentially a mining operation that depleted the fertility and tilth of the lands which had been converted from forest and prairie biomes. The founders of the organic movement addressed the problems created by plow-based agriculture: replenishing the “organic matter” in the farmed soils by importing large quantities of manures or composts. Organic pioneers also championed the on-site production of organic matter using “green manure crops” and “cover crops,” which involved raising plants that are not harvested, but “tilled in” for the purpose of building up the soil. However, if a crop production season is substituted with a season of growing a “green manure” crop, the overall land-use-efficiency of organic can be even lower. From an environmental perspective, there are several downsides to the organic approach. First, the total supply of such organic matter is limited. All the manures produced in US animal agriculture would only be sufficient to fertilize something like five percent of our crops. Even at existing scale, the US organic industry uses manures from conventional operations in order to have enough supply. When manures are processed to make them safer for use on food crops, there are surprisingly large emissions of the potent greenhouse gases methane and nitrous oxide. This “carbon footprint” of composting for organic farms is problematic from an environmental point of view. Fortunately, over many years of research and innovation, the farming community has developed better ways to build soil health in ways both more scalable and environmentally friendlier than the organic farming approach. Once again, there is an overlap with organic practices, but the cutting edge systems involve elements banned or impractical under the organic rules. The core of this new approach is a system under development by farmers since the early 1960s called “no-till” agriculture. 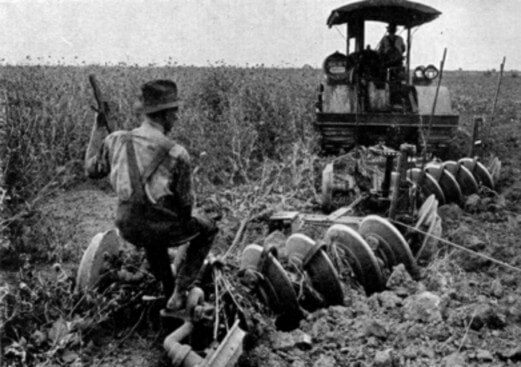 In 1943, Edward H. Faulkner wrote “The Plowman’s Folly”, which questioned the wisdom and necessity of the mechanical tillage and plowing of soil—practices that had led to environmental disasters like the Dust Bowl of the 1930s. Plowing farmland is probably the single worst aspect of traditional farming from an environmental perspective. However, it was not until the early 1960s, and the introduction of synthetic herbicides, that other means of weed control became possible. In a natural ecosystem like the wild prairies of Middle America, plants feed themselves and the soil via photosynthesis during the entire, frost-free growing season. The plants nutrients are naturally recycled. Without mechanical disturbance, the soil builds in quality. No-till based soil building systems today imitate natural ecosystems in that the soil is fed, first through the growth of the crop up until harvest, and then through growth of a cover crop until there is a hard freeze. The soil and the plant residues are left undisturbed by mechanical tillage. 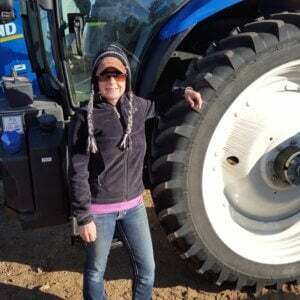 The crop for the next season is planted directly through the surface residues, and the growth of weeds is achieved using synthetic herbicides, not mechanical tillage. These progressive conventional farming methods greatly diminish erosion, sedimentation and fertilizer pollution of streams. Soils farmed this way can sequester significant amounts of carbon in stable forms below ground. No-till farming has been expanding and already represents a far larger fraction (over 35% nationally) of current farming than organic. Cover cropping has not yet been implemented to the same degree, but is steadily increasing. There are some organic, low- and no-till systems, but the greatest potential for expansion of science-driven, environmentally optimal row cropping systems is by farmers who have helpful tools like synthetic herbicides, seed treatment fungicides and insecticides, and herbicide tolerant, GMO crop traits. Perhaps the most difficult environmental challenge for farming concerns pollution of surface and ground water with fertilizers. When a crop is harvested it takes with it substantial quantities of nitrogen, potassium, phosphorus and other minerals which then serve the nutritional needs of animals and people. Those nutrients need to be re-supplied for subsequent crops. It is a major challenge to supply enough nutrition during peak demand without having the potential for some of those nutrients to move into ground water or surface water. This is particularly challenging for rain-fed crops in which precipitation is unpredictable. The most water-mobile nutrients are phosphorus and the nitrate form of nitrogen. Organic fertilizers supply the same mineral nutrients as “synthetic” sources, but these tend to be incorporated in the organic matter in forms that are more slowly released as they are “mineralized” by microbial activity. This makes these fertilizers less likely to pollute water during something like a spring rain event, but they can also be limiting for crop growth during high demand periods – one of the reasons for typically lower yields in organic. Manures also tend to contain excessive amounts of phosphorus, which is why their use on crops is discouraged around bodies of water like the Chesapeake Bay. Organic fertilizers can also mineralize well past the time when the crop is actively taking up fertilizer. A study of the ground water under conventional and organic greenhouses has documented how the less controlled release from organic fertilizers can be problematic. In irrigated crops, conventional growers have an option called “spoon feeding” of nutrients in which they supply water-soluble fertilizers in the irrigation water on an as-needed basis. To do this with organic-accepted options is much more expensive. There have been two historic examples of large-scale fraud in the California organic fertilizer business in which purportedly “natural” products were “spiked” with “synthetic nitrogen.” Ultimately the plant absorbs the same fertilizer components whether they start as organic or synthetic. Again, fertilization is a challenging trade-off, but conventional growers have more tools at their disposal to practice environmentally friendly fertilization. Agriculture has a major carbon footprint issue. Plants need nitrogen to grow, and that is a limiting factor in natural biomes, and particularly in agriculture. 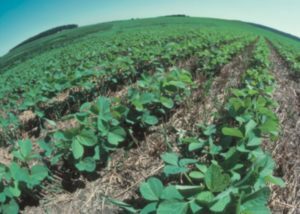 Both organic and conventional farmers get substantial quantities of the nitrogen they need from crops like soybeans, pulses and alfalfa that are legumes. However leguminous crops and other natural sources of nitrogen could never keep the global human population fed beyond something like 20% of our current numbers. What has been enabling humans to be fed since the early 20th century was a Nobel-prize winning breakthrough termed the Haber-Bosch Process (HB). It allows nitrogen gas from the atmosphere to be turned into ammonia which is the starting point for most of the nitrogen fertilizers that farmers use. The other ingredient for the HB process is hydrogen and it has always been most cost-efficient to get that from natural gas. The use of that fossil fuel comprises a significant “carbon footprint” of fertilizer and that is one of the most significant environmental impacts of global agriculture. Ironically, when organic farmers use manures or composts from animals fed with conventionally raised crops, they are also tapping into nitrogen that came into the system via the HB process. Cows and pigs and chickens don’t make nitrogen, they simple fail to absorb all of the nitrogen in their feed; what is left ends up in the manures that organic farmers need for their crops. In summary, the bad news is that both conventional and organic agriculture depend upon a problematic technology. The good news is that there are some recent technological breakthroughs that could solve that problem — but they wouldn’t be solutions available to organic farmers, under at least the current USDA organic rules. The hydrogen in water can be liberated through electrolysis, and if the electricity for that is generated from renewable energy like wind, water or solar energy it would not have the carbon footprint issue. A few start-up companies, funded in part by the US military, have been working out ways to use those sorts of energy sources to run small scale HB processes to make ammonia as a diesel alternative in remote locations. That same process could also be the starting point for fertilizers. Another way to get hydrogen could be the BioLeaf 2, recently developed by researchers at Harvard. It uses a catalyst to generate hydrogen from water directly using solar energy. This process could be used in conjunction with the small-scale Haber-Bosch alternatives described above. The end product of these innovations would be “carbon-neutral” nitrogen fertilizer and it could also be made on a distributed basis. By the current organic regulations, however, this nitrogen would be considered off-limits to organic farmers (except through the conventional manure route). Safe and effective pesticides employed within an IPM strategy can reduce environmental impacts from farming through resource use efficiency and by enabling other desirable practices. The natural limitation of organic pesticides leads to inferior pest control, compromises to IPM systems, and in many cases the use of less desirable materials. The organic yield gap means that even moderate expansion of organic farming puts pressure on limited land resources, with negative environmental ramifications. The state-of-the-art practices for soil building have productivity and environmental pay-offs with regard to water quality and greenhouse gas balance. These practices are best enabled by a suite of technologies, several of which are not available to organic farmers (e.g. 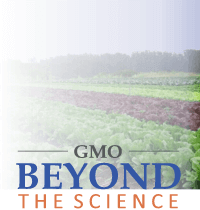 synthetic herbicides, biotech crops, precision-suited fertilizers). Composting has a little-recognized but well documented greenhouse gas problem and organic is also dependent on organic supplement streams originating on conventional farms. Agriculture has a significant carbon footprint—making the nitrogen fertilizer that feeds the growing human population. Organic agriculture shares in that footprint through its dependence on manures generated from conventional agriculture. New technologies could begin to eliminate that footprint, but their direct use by organic farmers would be denied under current rules. If society wants a way to “vote for the environment” through food purchases, it needs to either come up with a science-driven certification process or, better yet, foster full mainstreaming of the best agricultural practices regardless of whether they are organic or conventional. For policy makers, advocacy environmentalists, food manufacturers and retailers to pretend that organic is the best direction to pursue for an environmental farming solution is green-washing — at best. 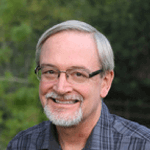 Steve Savage has spent 35+ years working in various aspects of agricultural technology. Trained in biology (B.S. Stanford) and plant pathology (Ph.D. University California, Davis), he has worked for Colorado State University, DuPont, Mycogen and as a consultant for various organizations and NGOs including the CropLife Foundation. He is a contributor to Forbes. His Twitter handle is @grapdoc.